As a nurse who has had several nurse entrepreneur ideas herself, I get approached often with the question: “Elizabeth, what exactly is a nurse entrepreneur? How did you get started on this path?” I LOVE this question because the answer is simple, yet fun! A nurse entrepreneur is exactly as it sounds. Someone who is already a nurse has had an idea for some kind of business and has decided to turn their nursing career into a business. Really quickly, before I introduce you to a successful online nurse business woman, I’d like to share a bit about my start into nurse entrepreneur ideas. It all began when I was working at a health and wellness center in Maryland. I had been at that job for about a year when my supervisor at the time approached me, asking me if there were other goals I wanted to set for my role at the organization. My boss introduced me to something called health and wellness coaching, which I subsequently went through a program and became a certified coach. Entering the world of coaching was actually just the beginning! As I started to work with some one-on-one clients, I was quickly introduced to the online world of business. One of my coaching clients early on was actually a marketing rep at a large firm. This coaching client encouraged me to get onto social media and introduced me to blogging. Poking around some inside of the LinkedIn entrepreneur groups, I stumbled across an online training. I signed up for and loved the conference call class- so much so that I paid my money right then and there to attend a live workshop with a business coach. Boy, oh boy, was I glad that I attended that event! I have talked about this a lot in my books, podcast, and videos- but as a nurse… I had no idea what I did not know about being an entrepreneur. In fact, I hired that coach at that live event and have continued to work with her off and on throughout the years. As nurses, we are trained in clinical skills and critical thinking knowledge. We aren’t provided with nurse entrepreneur ideas- at least I am not aware of nursing curriculum that includes this type of content. And, at the same time, the online space of business and opportunity keeps growing each day. Nurses who are looking for non-clinical roles or to use their creative skills in other ways are searching for nurse entrepreneur ideas online. This is all great stuff! And, I do believe that we need to seek out support and learn from those who have successfully done what we are setting out to do. Remember- you don’t learn this stuff in nursing school! And it can be very difficult (and quite lonely) to try and figure it out all on your own. 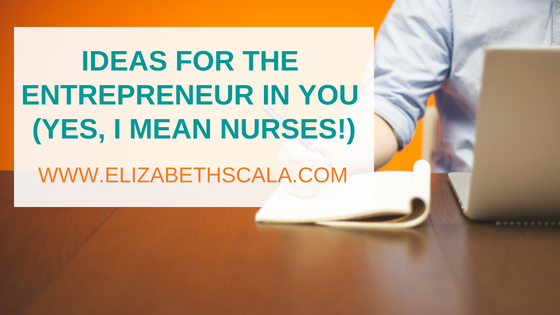 Since so many nurses approach me online asking those very questions about how to get started with nurse entrepreneur ideas, I figured… why not help out! I am super excited to bring you another five-part mini podcast Make the Shift series! This time we’re talking all things about online business and nurse entrepreneurship. And what the first step is to getting started with your nurse entrepreneur ideas! What’s awesome about Christy is her love of helping other people, specifically nurses. Christy not only coaches budding entrepreneurs in their nurse entrepreneur ideas- she supports nurses by teaching them how to set up an online business. If you’ve been thinking about the next shift in your nursing career– here’s your chance to make it happen! Take the first step and explore your nurse entrepreneur ideas. Tell her I sent you and enjoy this next chapter in your nursing career. I have been thinking of the kind of nurse entrepreneur I will like to venture into. This is because I have been told time and time again that I have good leadership skills will be very good at running a business. Now, the question is, what kind of nursing business should I try out? where will the funding come from and a host of other puzzling questions. I looked up nurse entrepreneurship online and stumbled into this website. I hope I am in the right place. However, this is just a start. I hope I can get the support I need to start my nursing business from this website. .